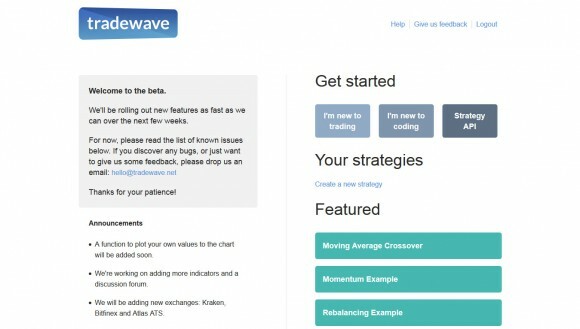 Tradewave is a new platform that allows users to program their own cryptocurrency trading bots and have them trading automatically on crypto currency exchanges for you. Tradewave is very similar to the Cryptotrader cloud trading platform that we have reviewed already in its concept, however there are significant differences between the two. 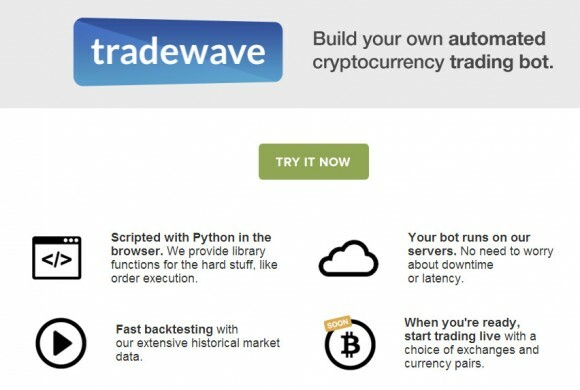 Tradewave uses Python for writing the trading bot code directly in the browser and then the bot runs in the cloud doing the trading for you, so you don’t need to worry about downtime or have to leave your computer on and connected to the Internet all of the time. 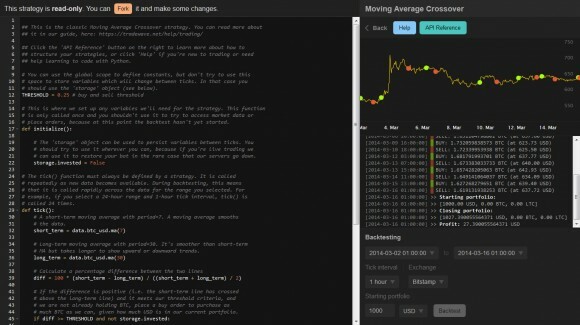 The platform supports backtesting of the code you write and for now there is no live trading, this feature is supposed to be made available soon. Actually the platform is still new and still in beta, so not all features are available, but you can give it a try like we did. The Tradewave platform comes with a library of functions that are ready to use, so you don’t have to be a programmer to be able to write a quick trading bot, though it might help for making a more advanced automated solution. In order to be able to use this service it will help to have some basic programming knowledge and you will be ready to quickly get up to speed with using Python and the functions to program your own bot and there are some example reading bot codes already available for you to start with and modify and experiment with. Once you login you will get access to short introduction about the basic trading concepts that you need to know about technical analysis and automated trading, as well as additional details how to program your own bot. 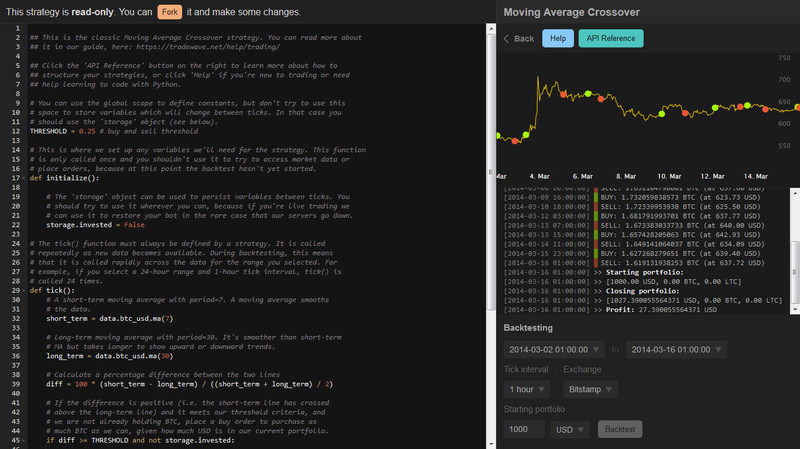 There are tree already available bots utilizing the following trading strategies utilized in bots: Moving Average Crossover, Momentum Example and Rebalancing Example. Once you get into the bot programming mode you will see the bot code, graphical output of the bot actions, a log of the actions as well as a form for backtesting your code against actual data. As we have already mentioned, currently you can only use the platform for backtesting against live data and that feature is available for free. The automated trading functionality is not yet available and when it becomes available it will be paid, though no information about the subscription prices for the moment. The crypto currency exchanges that are supported for the moment by the Tradewave platform are BTC-E and Bitstamp. New exchanges are apparently soon going to be added such as Kraken, Bitfinex and Atlas ATS. So we are going to be keeping an eye on the Trdewave platform development as it has the potential to become a serious alternative to other automated crypto trading solutions. So far things are working well and the platform seems very promising, so we would recommend to give it a try if you are interested in automated trading bots and more specifically about creating your own. Note that if you want to be able to actually trade with, the Tradewave will not work for you yet, so you better check Cryptotrader for that. Both platforms however are not very suitable for people looking for an easy and automated solution for trading crypto currencies that can be just started and with minimum configuration to work automatically. Also note that writing your own automated trading bot from the scratch or even using some already available code is riskier and you better do some extensive backtesting before actually running the code with actual trades. Another bit of warning, often actual trading conditions may vary from your backtesting results so always start with small trading amounts and program safeguards.